Most larger companies decentralize, treating each division as its own business earning its own net income. As these different divisions do business with each other, buying and selling different products, the transfer prices they set play a critical role in determining how they’ll share profits. Companies usually organize themselves into divisions that provide different goods or services and often do business with each other. For example, a clothing retailer may own several clothing factories; the retailer and each factory can be treated as separate divisions, sort of like companies within a company. Separate divisions of an oil company may produce, refine, and sell gasoline. Many large entertainment companies own film studios, movie theaters, and cable networks. The movie theaters and cable networks both feature movies and shows produced by the film studio. Suppose Jeffrey and Sandy both work for Dorothy. Jeffrey makes T-shirts that Sandy retails to customers. 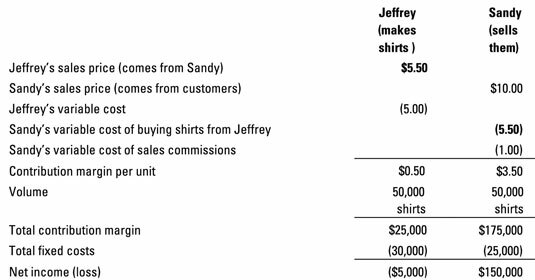 Each T-shirt costs Jeffrey $5 in variable costs per unit and $30,000 worth of fixed costs a year. Sandy sells each shirt to the end-customer for $10. However, to do so, she must pay an additional $1 commission per shirt, and $25,000 a year in fixed costs. Sandy expects to sell 50,000 shirts to outside customers. At what price should Jeffrey sell Sandy the shirts? Pick a number: How about $8? The figure uses contribution margin to describe how this price impacts both divisions’ profits. Remember that the contribution-margin income statement starts with sales and then subtracts variable costs, resulting in contribution margin. Then, to arrive at net income, you subtract fixed costs. 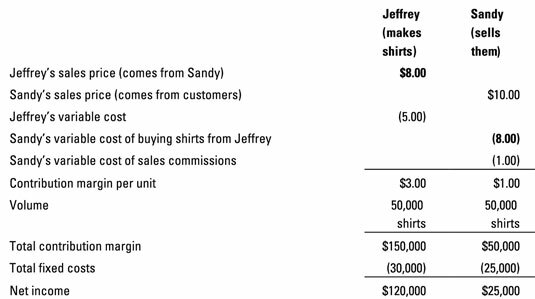 At a price of $8 per unit, Jeffrey enjoys contribution margin per unit of $3, leaving Sandy with only $1 per unit. Now multiply this contribution margin per unit by total sales volume for each division and then subtract fixed costs. Jeffrey gets $120,000 worth of net income, while Sandy gets just $25,000. Try a different sales price: $5.50. With a per unit price of $5.50, the shoe is on the other foot. Won’t Jeffrey be disappointed to learn that he earns only $0.50 in contribution margin per unit, while Sandy earns $3.50 per unit? Jeffrey incurs a $5,000 net loss, while Sandy earns $150,000 in net income for the year. Higher transfer prices shift income from the purchasing division (Sandy) to the selling division (Jeffrey). This discrepancy may lead to some discord. The fundamental problem here is how to set the transfer price so that the two divisions split profits. A higher price gives more profit to the selling division, while a lower price gives a larger share of profit to the purchasing division. Consider a few different approaches to address this problem. Negotiation: Let the selling and purchasing divisions fight over a price. Cost-based transfer price: The boss (Dorothy, in the T-shirt example), sets the transfer price equal to the selling division’s variable cost or total cost, adding a reasonable markup. Market-based transfer price: The boss sets the transfer price equal to the shirts’ market value, the amount that the selling division can sell them to outside customers for. Centralize: The boss declares martial law. She does away with all transfer pricing schemes and no longer computes separate profit for each division. Instead, she evaluates the selling division based on its total expenses and evaluates the purchasing division on its total sales.